Dogs can say a lot simply by their head movements and facial expressions. 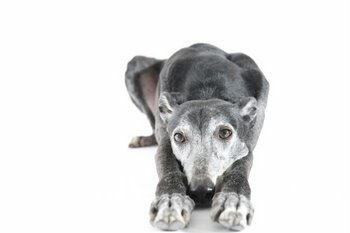 They rely more on postures and body language cues than barking to convey their moods and even their health status. Let’s look at four common dog facial expressions and what they mean. Find out what your dog’s trying to tell you in this related article: Woof! Woof! What Does My Dog’s Barking Mean? How it looks: A dog will turn his head to one side or he may move his head from side to side in a steady cadence. The pose is relaxed, but evokes canine curiosity. What the dog is trying to say: He is telling you that he is literally, “all ears” and fully focused on you. This can happen if you have just spoken that magical word, “treat.” Some dogs also tilt their heads to zero in on strange sounds to pinpoint its identity and location. However, uncontrolled head tilting can be due to medical issues like ear infections, or to a lesser degree, a toxic reaction to certain antibiotics, encephalitis or hypothyroidism. 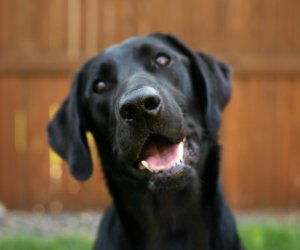 How to respond: Smart dogs quickly learn that this cute head-tilting pose can yield them attention, treats and praise. Be careful not to go overboard on the treats though or the dog might successfully train you in to being a steady treat dispenser! How it looks: A dog pulls both ears tight against their head. Their mouth may be opened and relaxed or closed. What the dog is trying to say: To fully deduce a dog’s mood you need to look beyond the flattened ears, since this is a common expression to convey fear or aggression. Look for these distinct differences. 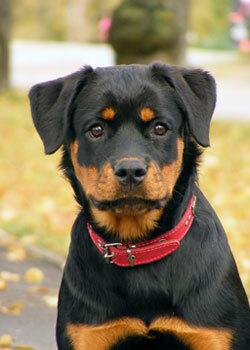 A fearful or submissive dog will sport a smooth forehead and cower. An aggressive dog will sport a tense, wrinkled forehead and may draw his lips back to show a snarl. Be mindful that a dog who has an ear infection may flatten his ears because of itchiness or irritation. How to respond: Regularly inspect your dog’s ears and sniff inside them to catch any early signs of a medical condition. Also check for any foxtails or burrs that may have lodged inside your dog’s ears after you return from a hike. Be careful when approaching a dog who has his ears flattened, his tail tucked and his body lowered. He may believe his only option is to lunge, bite and flee. Learn More: Pets Best offers Pet Health Insurance for a wide range of conditions and treatments, including ear infections. Get a quote today to find the right coverage for your pet! How it looks: A dog elevates one or both eyebrows while giving a wide-eye look. What the dog is trying to say: The dog may be taken by surprise – in a good way – such as receiving a Grade-A treat. The dog may raise both their eyebrows and widen their eyes in astonishment. Think of this as the canine version of a person walking into a surprise birthday party and having friends yell, “Surprise!” Some dogs will also raise one or both eyebrows when they are uncertain about a situation. How to respond: A dog who raises his eyebrows is living in the moment, not thinking about the past or worrying about the future. It’s a reminder to put down our cell phones, step away from the computer keyboard and play with the dog. You can also take advantage of a dog in this alert mindset and teach him a new trick. How it looks: The dog lowers his head while looking up at you in a non-threatening pose. This is often referred to as a hangdog look. What the dog is trying to say: Head bowing is a go-to posture dogs employ when they are unsure of how a person will react to them. This especially applies to dogs who are submissive, shy, or anxious. Dogs also bow their heads to other dogs as a way to avoid a fight. The lower-ranking dog does this as an act of submission. How to respond: Head bowing is done to appease and show submission. It is not an apology for a bad doggy deed, such as chewing your house slipper. Remember to be patient and use this moment as a teaching opportunity. The next time your pup gives you one of these looks, “listen” up. They could be trying to tell you something important about their health, how they’re feeling, or maybe they’re just trying to persuade you into giving them another treat!